Am seeking some advice on introducing our older, rescue BC to some livestock to manage his behavioural issues/give him more "work". We adopted him from a fairly grave situation when he was 1 or 1.5 years old (he's now probably 2 years old), so we assume he spent the first year of his life in poor conditions, not trained, not socialised and living under very stressful conditions. Nonetheless, we have persevered with him. He has many behavioural issues, including reactivity and "defensive-type" aggression towards other dogs and other animals in general when on the leash, due to his history of not being socialised, and then also being very unlucky and being attacked by a large off-leash dog during the very first week we adopted him. We are trying to address this with a behavioural therapist as well as other issues, including his strange bipolar moods with my husband. Anyway, up until now I have managed to give him sufficient physical activity everyday, and really tried to put a lot of focus on mental training, because without it he's pretty wild and distracted. We have started attending agility classes once a week, and on the other days I try to do a lot of obedience and trick training with him to stimulate his mind. He's a fantastic worker - really, really loves to work. Gets far too excited about it, but I'm also trying to work on that and redirect that excitement into better focus. Until now I have feared putting him anywhere near another animal (other than the very few dogs he does enjoy playing with) because he seems to go into a psychotic mental overload with anything - birds, cats, donkeys, horses etc. He has seen sheep through a fence, but he just goes into hyper reactive mode and tries to bark and lunge at them. So I've been really nervous about introducing him to anything with the fear he'll just attack and harm them. 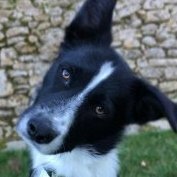 But I'm very, very curious whether he will or not, or if in fact it's just his herding instincts coming out to play, and if it would actually be seriously beneficial for him to have a go. We have a little bit of land, and would like chickens, and perhaps a sheep or two, but I'm very hesitant about how to go about it and if it would be a big mistake. I live in Spain, and am not fantastic with the language, so I can't necessarily just call up a local sheepdog trainer and get some help. There's also not a lot of sheep farms around us. So any online advice would be fantastic! Even if there's a good information pdf/book out there especially dealing with introducing problem older rescues to livestock. Anything would be greatly appreciated!